Oswego Harbor West Pierhead Lighthouse, originally uploaded by Scott Thomas Photography. Oswego Harbor West Pierhead Lighthouse after sunset from Fort Ontario in Oswego, New York last Memorial Day weekend. This photo is available for download for use in electronic and print media or as an art print via IthacaStock.com. Thank you for your interest. This entry was posted in Nature and tagged 18-200mm vr, blue, calm, dusk, great lakes, harbor, horizon, Lake Ontario, landscape, lighthouse, long exposure, new york, nikon D70, orange, oswego, peaceful, quiet, silhouette, sky, sunset, tripod, water. Bookmark the permalink. Absolutely gorgeous! LOVE those colours! It was one of those beautiful Oswego, New York sunsets it is know for. 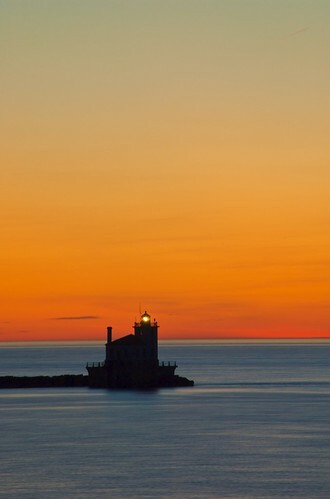 Oswego was even featured in National Geographic as being one of the 10 best places in the world to watch sunsets. Amazing! Awesome! And why they pick WordPress sites with dopey pictures for Freshly Pressed and not a post like this one, will forever boggle my mind. You don’t get more perfect than this. Thanks for sharing it. In all fairness to WP.com, Freshly Pressed is for all blogs not just photoblogs. I did get FP’d once and had a lot of visitors. Some even stayed on and became blogmates. Well, I agree Simone. The sky with its multiple colors is so beautiful. Thank you…it was a beautiful evening. I’m going to find that Lighthouse some day soon while cycling. There you go. The Freshwater Nation in all its glory. Have not made it up to the lake yet this year. That is going to change this weekend. I like that..”Freshwater Nation”. Wow, what a fabulous shot! It would look excellent as a poster, what brilliant colours! An overwhelming beauty you caught in this sky, a perfect composition with the lighthouse and the fine blue lines in the sea. Everything is so beautiful about this picture: the composition itself, the shades of course, the dark silhouette of the lighthouse. Serene and wonderful. LOVE the color gradation and the lighthouse in silhouette. Beautiful!